We hosted a dinner party on Saturday night. We kept it simple with two types of chili: one with meat and one with black beans and sweet potatoes. Both with lots of grated Monterrey Jack cheese, cilantro, green onions, and sour cream. Nick baked his sourdough bread — a recipe which he has totally mastered. 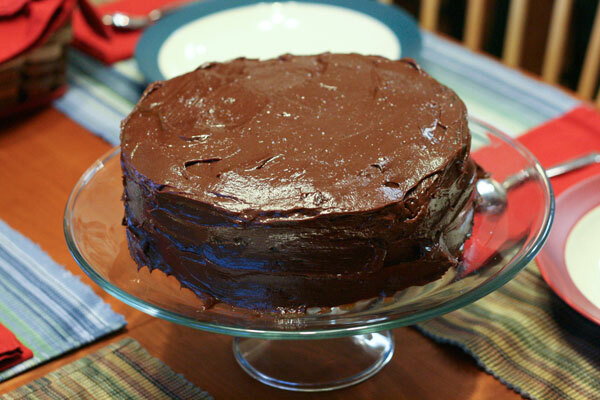 And I flexed my baking muscles, too, with a decadent cake from my Baked cookbook. This recipe has been bookmarked since Christmas. It is the bakery’s most requested recipe, after all. It’s sweet and salty, rich and moist, indulgent and sophisticated. And it gave me an excuse to make caramel. Three times. But let’s start with the cake, shall we? 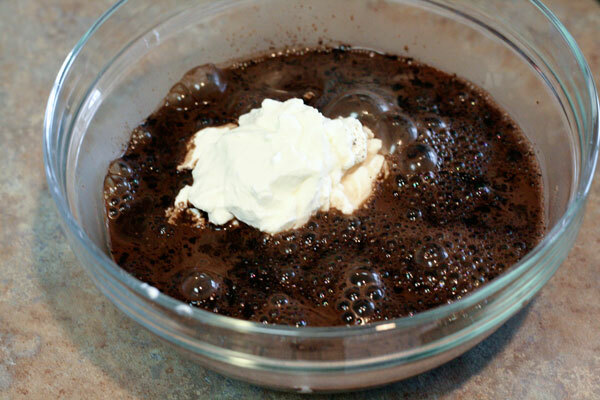 Add sour cream to dark unsweetened cocoa powder and hot water. 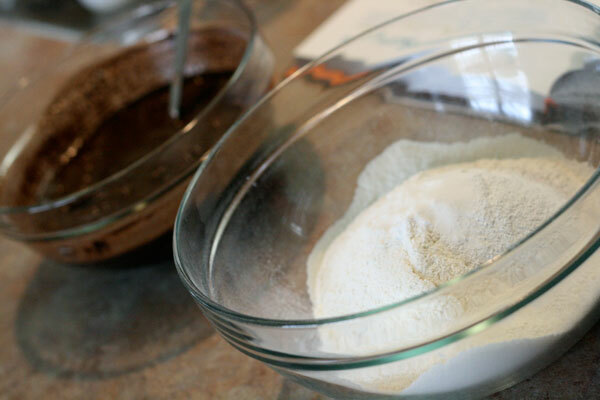 In another bowl, sift and combine the dry ingredients: flour, baking powder, baking soda, and salt. Then beat together the butter and shortening until ribbonlike, about 5 minutes. Add granulated sugar and dark brown sugar, and beat until light and fluffy, another 5 minutes. 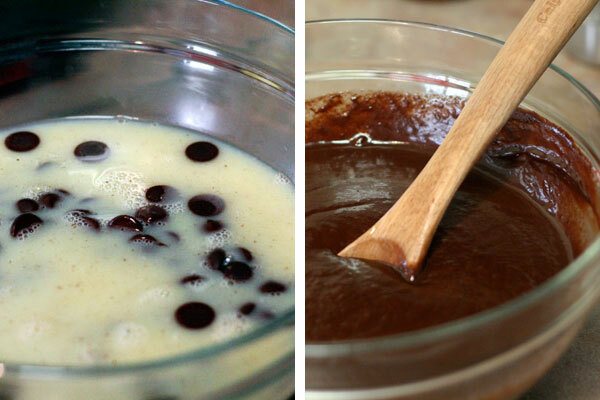 Add eggs and vanilla, followed by the flour mixture and the cocoa mixture. 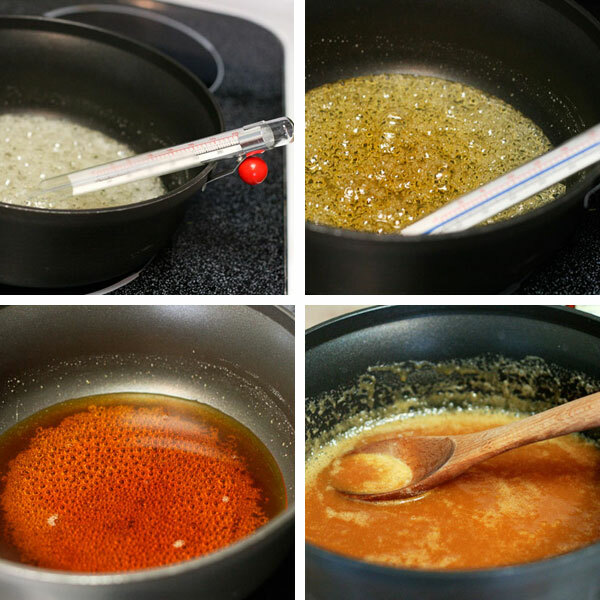 Put the cake in a 325°F oven for 35 to 40 minutes, then get ready to make some caramel! I got to break in another kitchen accessory with this recipe: my candy thermometer. And, yes, I literally did break it in. Caramel is easier to make than I thought. It’s just water, sugar, and light corn syrup. Stir together in a medium saucepan over high heat until it reaches 350°F. This version also calls for fleur de sel (fine sea salt) and heavy cream, which is heated in a separate small saucepan, and sour cream, which is whisked in at the end. After the cakes and caramels cool, start layering. 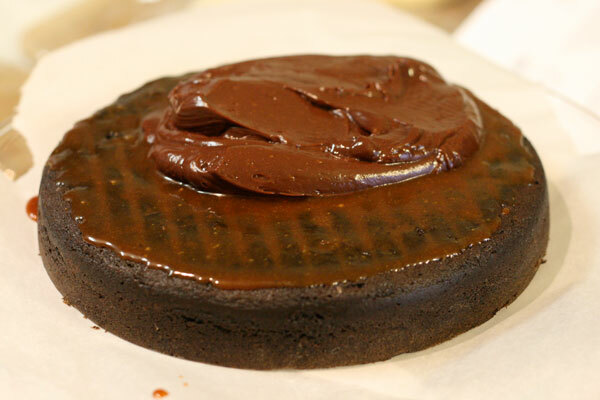 Place one cake on a serving platter (covered with strips of parchment paper to keep things neat and tidy), add 1/4 cup salted caramel, then spread 3/4 cup ganache on top. Repeat as necessary. Place the cake in the refrigerator (or a cold garage) to firm up before you frost the sides and top. Garnish with a sprinkle of fleur de sel. Everyone agreed that this cake is a hit. It’s just what we needed after our Dance Central Dance Battle. Valentine’s Day may have come and gone, but this is a dessert that you and your sweetheart can enjoy all year. I promise. It’s worth the effort. Just be careful with that candy thermometer. What sweet treats did you bake this weekend? Preheat the oven to 325°F. Butter three (or two) 8-inch round cake pans, line the bottoms with parchment paper, and butter the parchment. Dust with flour, and knock out the excess flour. Meanwhile, keeping a close eye on the cream mixture so it doesn’t burn, in a medium saucepan combine 1/4 cup water, the sugar, and corn syrup, stirring them together carefully so you don’t splash the sides of the pan. Cook over high heat until an instant-read thermometer reads 350 degrees F., 6 to 8 minutes. Remove from the heat and let cool for 1 minute. In a small saucepan, bring the cream to a simmer over very low heat. Meanwhile, keeping a close eye on the cream so it doesn’t burn, in a medium saucepan combine 1/4 cup water, the sugar, and corn syrup, stirring them together carefully so you don’t splash the sides of the pan. Cook over high heat until an instant-read thermometer reads 350 degrees F., 6 to 8 minutes. Remove from the heat and let the caramel cool for 1 minute. Place one cake layer on a serving platter. Spread 1/4 cup of the caramel over the top. Let the caramel soak into the cake, then spread 3/4 cup of the ganache frosting over the caramel. 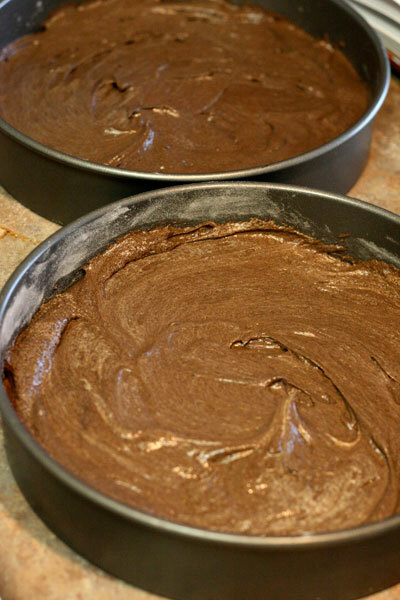 Sprinkle 1 teaspoon of the fleur de sel over the frosting, then top with the second cake layer. Spread with caramel frosting and sprinkle with 1 teaspoon of the fleur de sel. Then top with the third layer. Spread with caramel. Crumb coat the cake (see page 22) and put the cake in the refrigerator for 15 minutes to firm up the frosting. Frost the sides and top with the remaining frosting. Garnish with a sprinkle of fleur de sel. This cake will keep beautifully in a cake saver at room temperature (cool and humidity free) for up to 3 days. If your room is not cool, place the cake in a cake saver and refrigerate for up to 3 days. 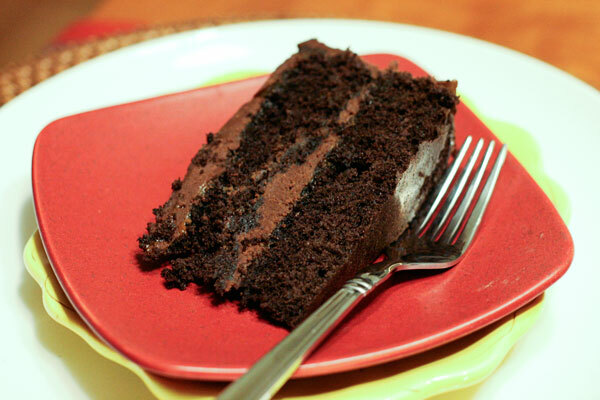 Remove the cake from the refrigerator and let it sit at room temperature for at least 2 hours before serving. This cake looks sooo decadent! I just learned how to make caramel also. It was a little stressful, waiting for it to turn amber, but worked out great in the end. I love the idea of adding coarse salt to it! Mmmmm…this cake was SO, SO good. Thanks again for a great night! Awesome, and I mean that literally! I am privileged to work with Emily and she brought some leftovers of this to work today. OMG…incredibly chocolatey and decadent, and that comes from someone who’s usually pretty indifferent to uber-chocolate stuff. Nicely done! 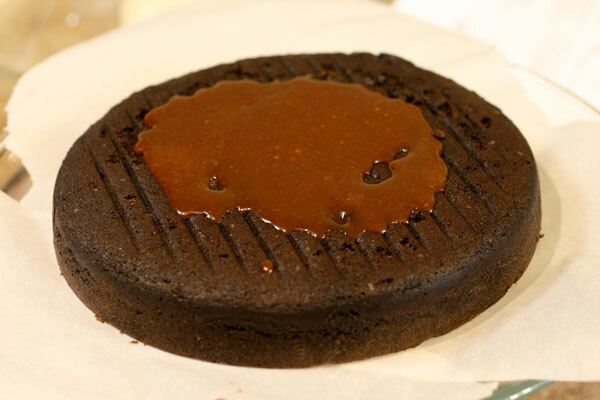 How do you keep the caramel from getting too hard and unspreadable after it cools and before you put it on the layers? The salted caramel will actually stay spreadable even after it is cooled to room temperature. If you make it a day early and store it in the refrigerator, just pop it in the microwave for a few seconds to soften it (like you would do with hot fudge). Right now I have leftover caramel in our fridge ready to drizzle onto an ice cream sundae this week! Speaking of chili, gotta give pumpkin chili a go. Seriously. It is much better than you can imagine and with Nick’s bread, forget about it. It gives it a nice depth and it balances well with the spice. This looks and sounds SO tasty! I am craving some cake now! Did you end up making the sweet potato chili I posted a few weeks ago? 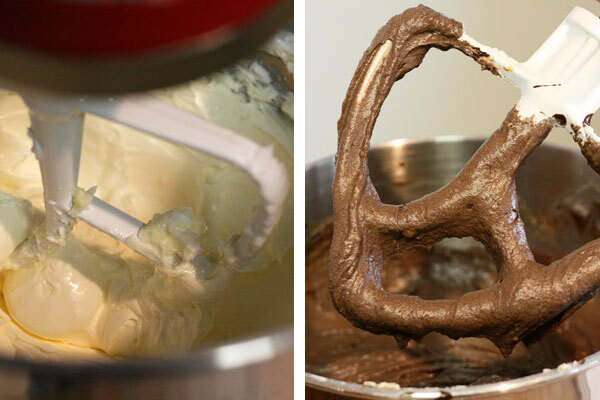 I can’t wait to make this cake – it looks incredible!!! I love every ingredient listed!! !